NBN - Page 2 - SILVER PEERS...USE IT or LOSE IT! better than the nbn at home. my telstra nighthawk wireless is hitting 45mb/sec out in a remote rural area. 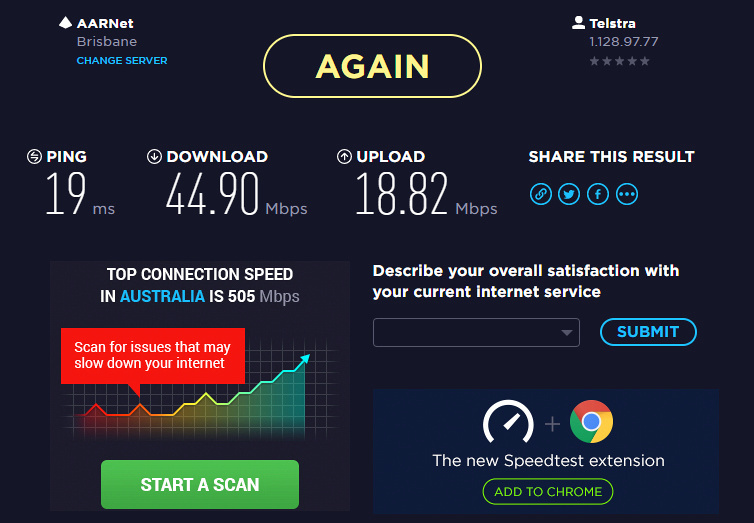 People in town are getting slower NBN speeds than they got with ADSL copper. and that is the limit anyway for a lot of people a long way from a node. so they should tell you that. They are lying low life rats. I have full fibre,and this rubbish Turnbull is talking about,digging up peoples yards,is exactly that,rubbish. It really depends on who comes to do the connection. The bloke who turned up to my house,to run the cable to the box on the outside didn't like digging. He persevered with the existing conduit,and eventually got the cable through,and didn't even disrupt the existing copper service. And,it took no longer than digging a new trench. I can get up to about 98mbps as a rule, but tonight the performance is surprisingly varied. It must be congestion at the exchange. I shall check it again tomorrow. If it's still so variable, I shall be talking to Telstra. Buck, I am not discounting wireless and I agree that 90Mbps is a very good speed. However, Taiwan has achieved 260+ Mbps with fibre and is aiming to reach 500 Mbps within 2 years. That is the speed we should be seeking or we'll be left behind the rest of the World. My NBN fibre to the node has been running faultlessy for about 16 months now. it never varies, maybe that's because there is no peak hour demand in my little ville... no pesky schoolkids to max out the system when school gets out at 3pm. The only change I've made was to pay extra....I now pay 89 bucks monthly for unlimited access with all Australian phone numbers included. This also includes all of my landline calls to mobiles. But Ill be switching to an Aussie Telco callef "mate" when my present contract with Westnet expires next June. Mate is only 65 bucks for the same deal and according to product reviews, they are the best. How far away from the node are you? Right across the road.... about 60 metres. That explains it. The shorter the run the better, and a good copper line and not too many others using the node. Fibre to the node is a very poor option. The "node" is the steel box at the end of your street corner. Most connections from the 'node' to the home are copper wires, some are as old as "JC". The descriptions is an "autobahn to a country road', ie, slow down you are hitting a bumpy ten km road from here on. Labor proposed "to the premises" which would mean no need of a barrier or slowed speed, but LNP changed all that and limited your speed by some intricate changes to the delivery system. If you are situated in a new development area, you can request your provider (ISP) to install a new fibre connection at your costs. It will remove any old copper and replace it with "fibre to the kerb" to "fibre to the premises". Yes, it will cost you money but will guarantee you the speed you want! Look at the excellent reviews for "mate". .....an Aussie Telco, based in Australia, staffed by fluent speaking Aussies ! NBN problems appear as the telco's problems to the consumer. Smaller providers rely on the likes of Telstra and Optus to provide the hardware. Basically, they buy the service in bulk and sell it in parcels. Who needs all this speed and what is it being used for? Trumble has said its video, - gamers, you tube, movie downloads, netflix, iview. Who are the main beneficiaries? Foreign owned companies like netflix, facebook, google and apple. Losers? the local video store providing local jobs to local people..
in recent months, I've become a dedicated netflix and abc iview junkie. I've come close to maxing out my monthly download limit of 100gb with Westnet. That's why I upgraded to unlimited download limit. Speed isn't an issue.... Netflix works beautifully with just 12 mb/s. I get 25 mb/s which is just icing on the cake. Why did I get Netflix ??.... because I was fed up with TV commercials. I no longer watch commercial TV except for ABC and sometimes SBS.